A glass of the finished "Rapid Cream Ale"
Last year, one of my favorite (and shortest-lived) beers was my cream ale. It began as the Kari's Cream Ale recipe on the American Hombrewers Association web site, which had won a gold medal at the national level in 2008. I made some minor changes to it, to bring it more in line with my own tastes. Specifically, I switched from 2-row Pale Malt to 6-row Pale Malt (supplemented with about 6 ounces of 2-row Pale since I didn't have enough 6-row), from WLP001 California Ale Yeast to Safale US-05, from whole Hallertau hops to Hallertau Mittelfruh pellet hops, and added a second mash step at 154F to possibly add some sweetness and body. Bitterness was also decreased slightly to 17 IBUs. I used the High-Efficiency Mash Profile, but modified it to match how the previous batch was brewed and to reduce the total brew time. I configured the first mash step to 149F for 30 minutes, and a second at 154F for 15 minutes. The boil time was shortened to 30 minutes, with a Hallertau addition at each end. This should be long enough to sanitize the wort, extract the bitterness and flavor from the hops, and result in a tasty brew. The original recipe called for a 60 minute mash and 60 minute boil. The beer was chilled to a yeast-safe temperature, and transferred to a sanitized fermenter. The yeast was added, along with the Clarity Ferm. Based on my recent experience with the Tilt Hydrometer in a batch in my basement, I don't think temperature control will be needed. The previous batch also used US-05 yeast, with a similar gravity, and stayed between 69F and 71F throughout primary fermentation without any temperature control. This batch will be in a stainless fermenter in the same ambient environment, so I suspect it will remain within the same temperature range. One of my goals for this batch was to see if I could reduce the brewing time without reducing brew house efficiency or impacting the flavor/appearance of the finished brew. I shaved the mash time from 90 minutes in the Picobrew High-Efficiency Mash Profile to 45 minutes. Despite that, I still hit (and in fact overshot) my target gravity and volume. I suspect the Dough-In step could be reduced to 15 minutes, and the mash time further reduced from 45 minutes. This is something I'll try with a future brew. Though I don't know that it was necessary, I added some Amylase enzyme to the mash to help accelerate and complete the conversion. This may be a cause of the higher-than-expected gravity. I reduced boil time to 30 minutes for this batch, with a hop addition at the 30-minute and 5-minute marks. Again, I still hit my gravity and volume targets. Although I've read that boil times shorter than 30 minutes could introduce DMS, off-flavors, or other issues, I'm not sure that's true either. I recently had a batch accidentally run with a 15-minute boil time. The judges who tasted it did not report any DMS or other off-flavors. This makes me think that reducing boil times to 15-20 minutes might work for at least some beer styles. Reducing the mash time and boil times for this batch reduced the total brewing time from "go" to "in the fermenter" to about three hours. A typical batch runs for about four hours, with some running much longer. I suspect that additional adjustments could reduce the brewing time by another 20-30 minutes. 05/28/2018: There were no foaming problems with this batch. After brewing, the wort registered 13.5 to 14.0 Brix on the refractometer and 2.4 gallons in volume. I added distilled water to lower the gravity down to the target value of 13.0 Brix, ending with a volume estimated at 2.6 gallons. This batch was brewed from 7:10pm to 10:11pm, approximately 3 hours end to end. Despite the shortened brew time, the original gravity and volume targets were exceeded slightly. This tells me that it should be possible to reduce brewing time with other batches in the future without compromising quality. In this case, a 5-pound grain bill had no problem converting well with a 45-minute step mash. I suspect that might not have been the case if we were talking about a larger grain bill like 8-9 pounds. A grain bill that large might benefit from an extended mash time (2+ hours). 05/29/2018: A visual check of the airlock showed that an active fermentation is underway. The bubbles coming through the airlock were fairly steady, each "burp" a few seconds from the previous one, so I am confident the yeast are happy in their Cream Ale environment. 06/10/2018: The beer was bottled, using three small carbonation tablets per bottle (low carbonation). The beer was an extremely light color with a great deal of cloudiness. My suspicion is that it will not be as good as the last batch, which means that shortening the brew session on this beer might not have been a good move. That makes sense based on a book I've been reading recently. 06/14/2018: My impatience got the better of me and I placed a bottle of this in the freezer to chill, so that I can gauge flavor and carbonation. The beer is very cloudy at this point, and I suspect it's unlikely to clear up any time soon. 06/17/2018: A bottle of this placed in the fridge last night resulted in a very lightly colored, cloudy beer with a decent head. The aroma spoke of the noble hops in it. The flavor was light, slightly lemony, and very easy to drink. 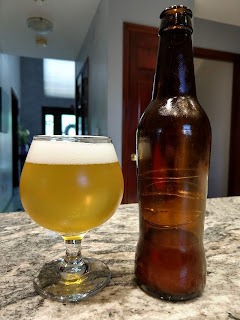 While not the equivalent of the original version of this cream ale recipe, for a beer produced from grain in about three hours, it's pretty good. I'll produce the next version with the usual mash and boil schedules and compare them. 06/24/2018: The beer pours a very hazy yellow with finger-thick white head that lasts quite a while. The aroma is malty, slightly citrus, and slightly yeasty. The flavor starts malty, then turns a tiny bit tart (almost but not quite lemony), then mildly bitter. The finish is mildly bitter and grainy, and lingers a bit. In all, it's drinkable and somewhat summery, but definitely NOT the equal of the original. If you didn't have the time to do the full-length mash and boil, this would be an OK beer to make. If possible, though, I definitely recommend doing a full-length mash and boil.